I recently polished my car's headlights because they had gotten quite foggy. I learned some things that I'd like to share, and the results are pretty impressive. 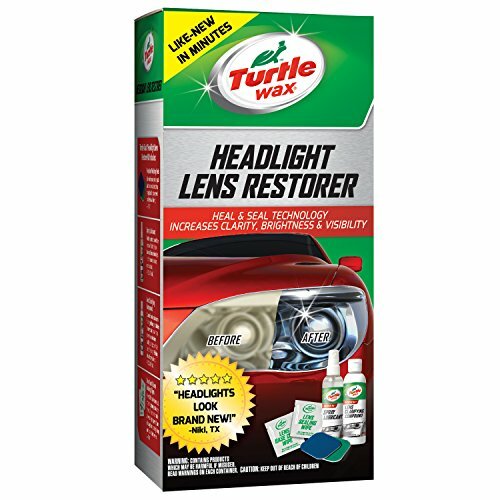 I used a Turtle Wax Headlight Restorer Kit that I got on Amazon for $7.99. This kit comes with a lot of things, but I only used half of them. The results I got aren't perfect, but they're pretty good considering I only spent about 30 minutes doing this. First, I used some water and a clean old t-shirt to wipe any dirt off of my headlights. The kit includes a "Lens Clarifying Compound" which I then applied in small dabs about the size of a dime every 4 inches or so. I rubbed the restoration compound into the headlights in a circular motion until I couldn't see any more compound on the headlights. I repeated this three or four times using a clean section of the t-shirt each time. Finally, I buffed the headlights as much as possible to make sure there was no more clarifying compound on them. The headlights were pretty clear after that, so I called it a day and skipped the next step. (So I didn't use the "Spray Lubricant" or the "Restoration Pads".) I opened up the "Lens Base Coat Wipe" and wiped it on each of the headlights. After waiting a couple minutes for the headlights to dry, I opened up the "Lens Sealing Wipe" and wiped it on both of the headlights. My headlights still have some chips in them from rocks, but they're no longer foggy. Do you have any car tips that you'd like to share? Let me know in the comments!